This is another quick and simple dish from Donna Hay’s Off the Shelf , and I served this chicken with spinach polenta with balsamic tomatoes. The photos and the straightforward nature of the recipes in this book make each and every thing in it difficult to resist. I looked through the Mediterranean chapter for ideas for what to serve with the polenta. Fish roasted in capers and lemon butter was one option. The balsamic and tomato roast chicken looked good but was too similar to the polenta dish. The tuna and grilled vegetable salad wasn’t quite right, but I’ll definitely be making that eventually. Likewise, the green olive baked chicken was almost perfect, but because cherry tomatoes were included in it, I finally settled on the gremolata seared chicken. Gremolata was made by stirring together chopped flat-leaf parsley, chopped salt-packed capers that had been rinsed and drained, lemon zest, and black pepper. That mixture was sprinkled on chicken breasts, and the chicken was seared in olive oil in a saute pan. In the book, this chicken is shown being served with salt-roasted potatoes and steamed green beans. I’m sure that would have been delicious too, but the chicken also worked very well with polenta and roasted tomatoes. If I had been planning ahead, I might have applied the gremolata to the chicken and let it sit in the refrigerator for a few hours before cooking. And, certainly, the chicken could have been grilled or baked rather than pan seared. The gremolata provided a very easy way of adding a lot of flavor to the blank canvas that is chicken breast meat. Now, which page of the book should I cook from next? Looks great! I love salt-packed capers--they have a much more complex taste than the brined ones. The ones I get from Carluccio's have this great raspberry note to them. The Gremolata is bubbling with flavors! I love the balsamic tomatoes very very much. Such a simple but an awesome recipe for the beautiful tomatoes. My garden is doing ok, now but only after the last rain.. before that every little flower that bloomed dried off the heat. I don't think I've tried gremolata before. But that looks fantastic though. ;-D *drool* I wish that this is my dinner for tonight. Need to give gremolata a try! that is a wonderful way of preparing chicken breasts! 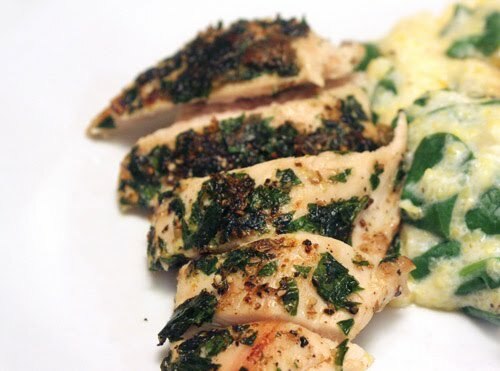 Heard of gremolata, but never thought to sear it on chicken...looks delish! I always love the flavor a gremolata gives food. Very nice. I've never used gremolata before... hmmm... should give it a try ;) thanx! Everytime I go through one of her books, I am tempted to simply start at page 1 and cook my way through the entire book! It's just that it is not always handy to do so, but it's tempting, very tempting and this is another gorgeous recipe! I have to admit that I'm not usually a fan of white meat chicken, but this looks really good. Each piece looks plump and juicy. This looks absolutely fantastic. I love the blog and your pictures inspire me to get in the kitchen! Simple, yet big on flavor. I love it Lisa! This looks wonderful!! The gremolata sounds so delicious, great pair up with the polenta. I love it! I have never made a gremolata before. This looks amazing and flavorful. Very nice! Sometimes a chicken breast can be boring and I honestly prefer dark meat but the gremolata changes everything. This dish is packed with heavenly flavors! Wow. Funny thing is, I'd never heard of Donna Hay until last week and now it seems she is all everyone is talking about. And all of her recipes look fab! This one looks so amazing and delicious. If you can't participate, feel free to spread the word--there are prizes for that too! Gremolata must add such wonderful flavors to the chicken, awesome! Never had gremolata..sounds yummie and with chicken must be really tasty...love the pictures! I love the brightness gremolata imparts to anything you top it with. Great with seafood, too. I love Donna hay's recipes & this one is no exception!! I love gremolata it is so healthy too! 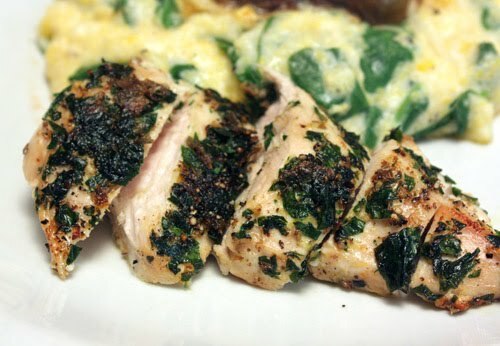 We are always looking for new chicken recipes and this one looks so flavorful!